At least 13 people including the gunman identified as Aaron Alexis, 34, died during a Monday morning attack on the Navy Yard complex in Washington, DC. Officials say the motives of the shooting are not yet known. Pentagon officials have said the Navy would wait 24 hours before releasing any of the victims' identities. Police were initially looking for two other potential shooters, though the FBI announced Monday that it had ruled out the possibility of a second shooter, while DC police felt "comfortable" that a lone gunman was responsible for the shooting incident. At least 13 people have died in the attack so far based on official statements by DC officials. Some people were also injured, including several police officers, but only one of them being wounded by gunfire, DC Police Chief, Cathy Lanier said during a briefing. Thousands of workers remained locked up at the Navy Yard buildings for hours as they were told to "shelter in place" until officials could safely evacuate them from the facility. "This is not over. The building is still in lockdown, as are other buildings. Still being treated as an active search. No one is moving right now," Rear Admiral John Kirby, the US Navy's chief spokesman, told reporters before the lockdown was slowly lifted. The investigators haven’t identified a motive behind the attack, DC Mayor Vincent Gray said, adding that there was no indication it was an act of terror. “The big concern for us right now is that we have potentially two other shooters that we have not located at this point,”DC Police Chief, Cathy Lanier, said. The suspected gunman, whom the police killed, was identified as Aaron Alexis, 34, of Texas. Alexis left the Navy on January 31, 2011 as a petty officer 3rd class -- the circumstances of his departure from the armed forces was not immediately clear. Alexis had since then worked for US fleet logistics support squadron No. 46 in Fort Worth, Texas, according to the AP. The US Navy stated that his home of record was New York City. He was reported to hold a “secret” security clearance and had a military issued ID card. “He did have a secret clearance. And he did have a CAC (common access card),” Thomas Hoshko, CEO of The Experts, the firm contracted by the Navy, told Reuters. A Hewlett Packard spokesman said Alexis worked for the company as a contractor, with duties to "refresh equipment used on the Navy Marine Corps Intranet (NMCI) network." He was officially employed by a company called "The Experts." Alexis was a practicing Buddhist known to frequent the Wat Busayadhammavanaram Meditation Center in Ft. Worth, Texas, although at least one other visitor came to be wary of Alexis because of his attitude. “He would help people if they came in carrying heavy things,” J. Sirun, an assistant to the monks at the center, told the Washington Post. “From the outside, he was a quiet person. But on the inside, I think he was very aggressive. He did not like to be close with anybody, like a soldier who has been at war." A spokeswoman for the MedStar Washington Hospital Center said that it had received three gunshot victims from the Navy Yard. The victims said that shots from semi-automatic guns were fired at them, she added. The specific weapons used in the attack were confirmed by authorities as an AR-15 assault rifle, a shotgun and a handgun. Authorities said Alexis arrived at the Navy Yard with a shotgun and obtained the Ar-15 and handgun from a safe at the military site. 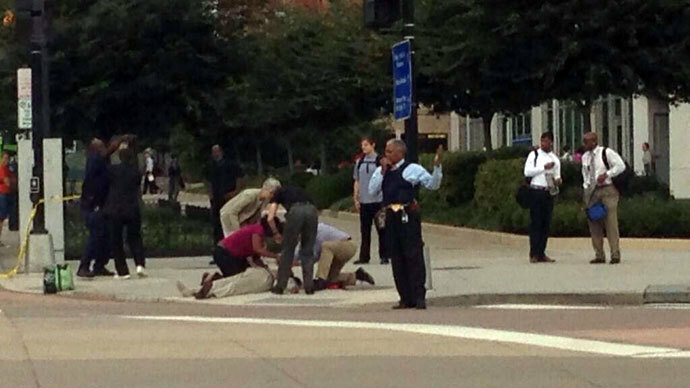 “I’m deeply shocked and saddened by the shooting this morning at the Navy Yard. Our thoughts and prayers are with the victims and their families,” Ray Mabus, US Navy Secretary, said in a statement. The shooting took place inside the Naval Sea Systems Command Headquarters (NAVSEA) building. It is the largest of the Navy's five system commands. That center engineers, builds, buys and maintains ships, submarines and combat systems that meet the fleet's current and future operational requirements. Some 3,000 people regularly work out of that facility. Some witnesses said a gunman opened fire from the fourth floor, aiming down on people in the first-floor cafeteria. The others said a shooter fired at them in a third-floor hallway. It’s not clear if the witnesses on different floors were describing the same suspect. After going on the rampage, one of the gunmen reportedly barricaded themselves in one of the rooms where he was cornered by the police. Hundreds of police officers and FBI agents were initially involved in trying to get control of the situation. Fire and emergency crews also responded to the scene. A “shelter in place” order has been issued for Navy Yard personnel. The area around the Navy Yard was cordoned off, schools were on lockdown and planes at nearby Reagan National Airport were briefly grounded so they wouldn’t interfere with law enforcement helicopters.